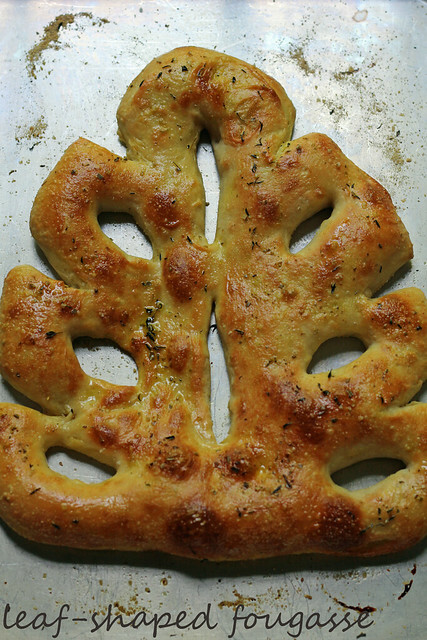 In a kitchen without A/C, mid-summer bread baking is not really my idea of a good time, but the oven doesn’t need to be on too long for Craig Kominiak’s Leaf-Shaped Fougasse. From what I gather, French fougasse is similar to Italian focaccia, and the teardrop leaf shape is traditional in Provence. I should research the technical differences between the two breads, because I’m sure there are some, but for this purpose, we made the same easy dough recipe that we used for the focaccia last year (overnight rise and all that stuff). I thought that getting the dough into the teardrop shape would be diffucult, but it wasn’t at all and I followed Cher’s suggestion to easily cut the pattern in the dough by snipping it with kitchen shears. Also, I did my cutting directly on my sheet pan (which I sprinkled with cornmeal but did not line with parchment), and that saved me from having to delicately move around and transfer the shaped bread. I find soft, bubbly, salty, oily bread like this to be addictive, and the hole pattern in the fougasse makes for little sections that are way too easy to rip off and snack on. After R & I demolished the left side, I quickly wrapped up the right side for the freezer, just to stop ourselves from eating the whole thing in one go. The word “fougasse” makes me think of the band Fugazi, but I guess that’s for another blog. For the recipe, see Baking with Julia by Dorie Greenspan (a modified version of the dough recipe itself is also here and there’s a video here that includes Kominiak shaping, cutting and baking the fougasse). Don’t forget to check out the rest of the TWD Blogroll! HAPPY CANADA DAY! This bread looks great. I’m enjoying Canada day, despite it seems to be one of the hottest days in Montreal I’d love to have one piece of that focaccia! Picture perfect beautiful! I want to make this now! Though I have to wait..
your fougasse looks absolutely beautiful! I admire your bread, and your discipline to freeze it in part before eating – I´m sure I would have had in 1 go, just myself ! Your bread looks awesome. I feel like hiding in a corner when I see what a fabulous job all of you have done.